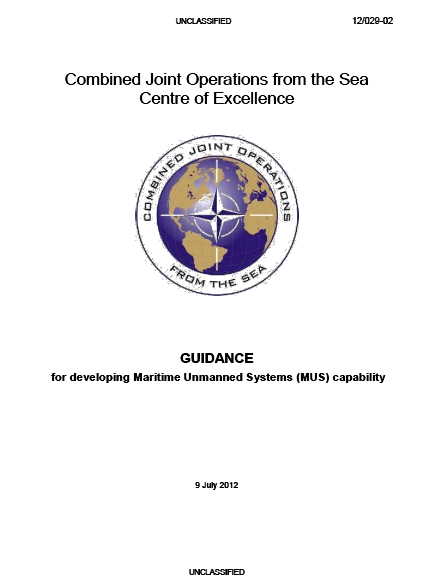 The following document was released by NATO’s Combined Joint Operations from the Sea Centre of Excellence in July 2012. The areas for MUS to contribute to naval needs derive from their operational advantages, which include: autonomy, risk reduction, deployability, environmental adaptability and persistence. (9) Time Critical Strike (TCS). (7) Maritime Interdiction Operations (MIO) Support. Based on today‘s capability, future advances in technology will enhance endurance, processing, autonomy, and interoperability. Many of the missions are demanding in terms of autonomy and propulsion. Achieving the level of autonomous intelligence collection required for persistent capabilities will be challenging. Autonomous modes of operation and the technology required to shift from one level of autonomous operation to another are still under development, many shortfalls have been pointed out in the area of engagement/intervention. UUVs have a limited ability to communicate with the outside world and the use of UUVs, in particular for CN3, requires considerable electrical power for transmissions. Cyber defense challenges include threats to the MUS vehicle itself, and its feeds and products. A careful balance between the level of autonomy achieved and the vulnerability to cyber attack will need to be developed. It is considered that the realm of MUS has a lot to offer, increasing operational effectiveness, reducing risk to human life and moreover represents a potential to reduce operational costs.While the greatest cost-effectiveness could be achieved by agreeing to a set of common platforms and command and control systems for such vehicles, ongoing Research and Development (R&D) will still drive future trends in MUS technology. Each nation will need to procure onboard sensors and other payloads according to their own requirements. To date, surface and subsurface MUS capabilities have received much less R&D attention and funding than Unmanned Aerial Vehicles (UAV) and require capital investment to catch up. There is also less data available from which to conduct comparisons of operational effectiveness between manned and unmanned platforms. However, such surface and subsurface capabilities should compliment existing and emerging UAVs to ensure that NATO can effectively counter the wide range of emerging threats in the maritime environment.